Lapel badge, cardboard, generally circular, with ribbon, pin, fund raiser for War, Paris Day, 14 July 1917, by I. Lapina, Paris, France, 1917. Lapel badge, cardboard, ribbon strip at top, fund raiser for War, Paris Day, 14 July 1916, made by I. Lapina, Paris, France, 1916. Lapel badge, cardboard, lemon-shaped, fund raiser on National Day of the Orphans of the War, by Chambrelent, Paris, France, 1915-1918. Lapel badge, paper flag of France, wrapped round pin, fund raiser, R.F. motif on front, 'Aux Poilus le Parlement, Christmas 1915', made by Lapina, Paris, France, 1915. Lapel badge, cardboard, circular, with pin, fund raiser on Paris Day, 14 July, 1916, by Devambez, Paris, France, 1916. Lapel badge, paper flag of France, wrapped round pin, fund raiser, Senat rosette on front, 'Aux Poilus le Parlement. 31 Octobre 1er Novembre 1915', made by I. Lapina, Paris, France, 1915. Two lapel badges, oval cardboard, fund raisers, Day of Paris, 14 July 1917, 128th Anniversary of destruction of Bastille, made by J. Barreau, Paris, France, 1917. Lapel badge, cardboard, silk ribbon at top, fund raiser for War, Soldiers' Days, 25, 26 December 1915, made by I. Lapina, Paris, France, 1915. Lapel badge, generally circular, cardboard, with silk ribbon, pin, fund raiser, Journee du '75', made by Poyet, Paris, France, 1915. 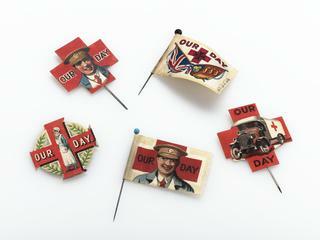 Two paper badges, cardboard badge or cartouche shaped, fund raisers, worn by nurses on Day of the Orphans, 1 and 2 November 1916, made by Le Papier, Paris, France, 1916.